I kind of hate the phrase “going above and beyond.” Part of the reason is that I think our standards should generally be high enough that the “regular” experience a customer receives is pretty darn outstanding. 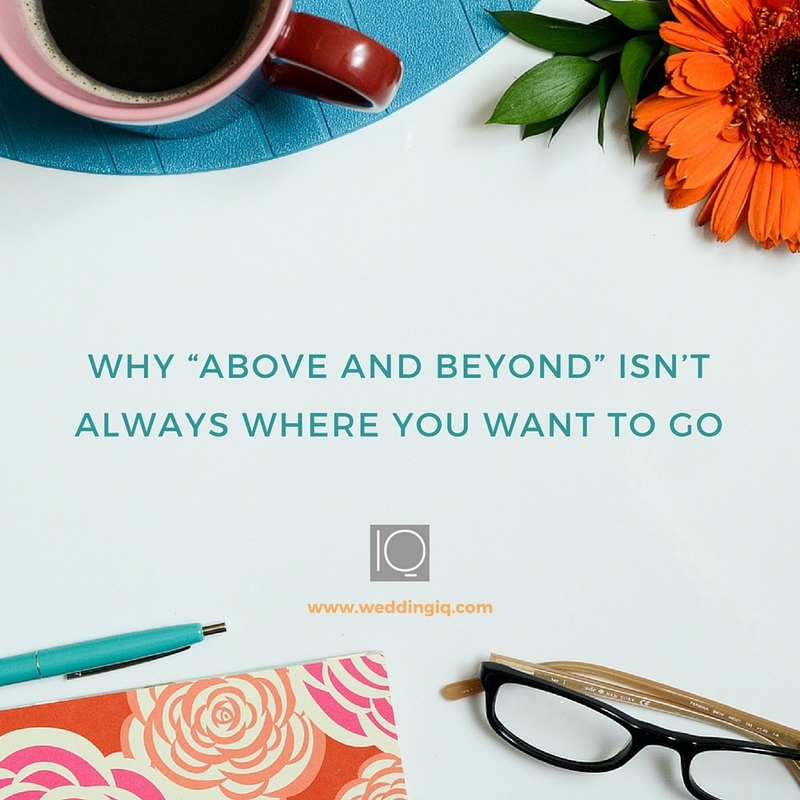 But also, I think the “above and beyond” mentality sometimes comes from a sense of insecurity on the part of small business owners, and that can easily come back and bite you when you least expect it. A long time ago, I saw a wedding business owner (I believe it was a photographer) post to a message forum seeking ideas for gifts for her clients to thank them for booking her. She received a bunch of suggestions, from edible treats to gift cards to clever mementos by which her clients would remember her. One very smart person, however — and no, I’m not cleverly referring to myself! — pointed out that the service/product the client receives is the thank-you. The client and the business owner are entering into a transaction in which the client pays an agreed-upon rate for an agreed-upon commodity. And really, it is just that simple. What we deliver to our clients is thanking them plenty for having invested in us. And yet, business owners continue to rack their brains for ways they can do more, more, more for their paying clients. A nice gesture, for sure. But what happens when you change course? Say your finances take a turn for the worse — suddenly, you can’t afford those Starbucks cards packaged in the rustic, raffia-wrapped gift box that your former clients raved about in their online reviews. Or say your business really takes off, and you’re getting more inquiries than you could possibly ever service. Now, those free anniversary portraits you gave away to thank your wedding clients are overwhelmingly impossible to schedule and you can’t keep up, disappointing people when they were never truly entitled to the portraits in the first place. “Above and beyond” can apply to communication standards as well. I, for one, have had to make the decision to purposely step back from the phone and the BlackBerry, because I was creating a monstrous burden for myself. Since starting my business 10 years ago, I’ve always prided myself on being lightning-fast at responding to emails, and being accessible to clients almost all the time. The problem with that accessibility is this: emails beget emails, and it’s very easy for a simple exchange to turn into the equivalent of a never-ending “instant messenger” session. (Easy to manage when you have 10 clients — not so much when you have 400!) And, ultimately, life does sometimes get in the way, and sadly, clients aren’t always that understanding when your illness, or your family emergency, or your vacation, affect their wedding plans. How many reviews have you read where a client points out, “At first, Susie Florist always replied instantly to our emails and she was great! But as time went on, we had a few instances where she took days to get back to us and it just really stressed us out. Therefore, I had to deduct a star for responsiveness.” Who knows, maybe Susie Florist got bogged down with wedding production, or had a death in her family, or some other circumstance. It doesn’t really matter, because she stopped going “above and beyond” when it came to communication. Please know that I am not advocating blowing off your clients or not being grateful for them. Quite the opposite: I think that my company’s reviews are a testament to the service we provide. It’s just that, in an effort to constantly go “above and beyond,” we sometimes create unrealistic expectations and our reputations can suffer as a result. On the other hand, when the bar is set high, yet achievably so, and the business owner focuses on delivering what’s promised, clients feel great about the experience they receive and the business owner can replicate that experience for everyone they serve. Why Should Other Vendors Refer You? Are You Feeding the Budget Beast?